I am a 3rd grade teacher and I enjoy creating activities and worksheets that make teaching common core math standards easier. 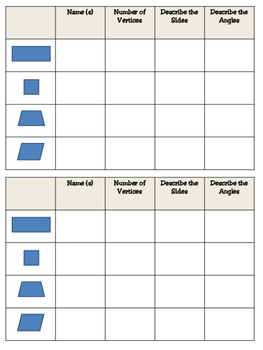 This activity aligns with the common core standard 3.G.A.1: Understand that shapes in different categories may share attributes, and that the shared attributes can define a larger category. 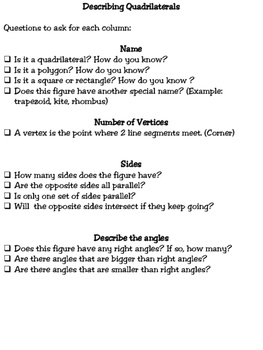 This packet includes a list of questions to refer to when students are completing quadrilateral graphic organizer. 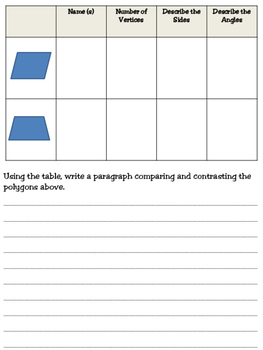 Using the questions, students can practice describing the attributes of quadrilaterals on two practice pages. Then, students are able to compare and contrast the attributes of 2 quadrilaterals in paragraph form. This is a great activity for small groups, centers or stations, extra practice for students who complete work early, or to send home with students for extra practice. Enjoy!